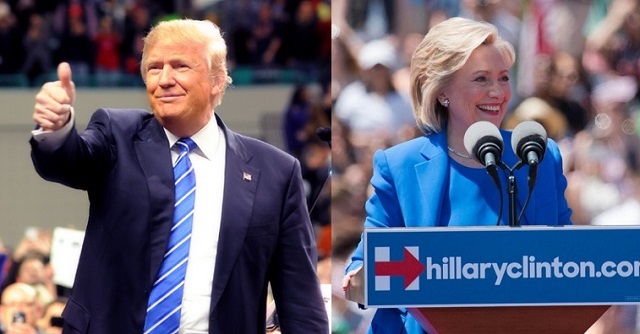 Donald Trump and Hillary Clinton are statistically tied in both Florida and Ohio just two days before Election Day, according to a CBS News poll released on Sunday, November 6, 2016. Trump slightly leads Clinton 46% to 45% among likely Ohio voters and both candidates are tied at 45% to 45% in Florida. Both poll results are within the margin of error at +/- 3.6 for Florida and +/- 4.1 for Ohio. Trump's comeback in these critical swing states during the final days of the presidential election suggests that voters who had remained on the fence are now breaking for the Republican nominee, especially after the FBI announced that it was re-opening its investigation into Clinton. 85% of Republicans and 57% of Independents in Ohio described Clinton's email issue as "bad, and it’s worse than anything I dislike about Donald Trump" while only 5% of Democrats felt the same way. It's not surprising then, that Trump leads Clinton 51% to 32% among Ohio's Independent voters. Like Ohio, 88% of Republicans and 56% of Independents in Florida described Clinton's email issue as "bad, and it’s worse than anything I dislike about Donald Trump" while only 8% of Democrats felt the same way. Trump also leads Clinton 47% to 34% among Florida's Independent voters. A Real Clear Politics average of polls also reflects a tightening of the race in those battleground states during the final days of the election where Clinton's lead over Trump has dwindled following the FBI's announcement.